This article is an expansion of the Create a new RTB campaign article, and walks you through the different options you can select in the supply section of the campaign editor. Category targeting enables you to target your campaign on the categories passed on to us by the SSP/publisher. These categories refer to the IAB categories and are defined on contextual content. You can find the full IAB taxonomy here. The quality of the categorization varies per SSP. Google and AppNexus have regulated processes to audit traffic, smaller SSPs often leave the categorization up to the publisher. You are able to include or exclude both tier 1 and tier 2 IAB categories. If you would like to target a tier 1 category, select "Top Categories" from the dropdown menu. For tier 2 categories, please select "Sub Categories". You can then select the category of choice in the dropdown menu. The selected categories will be marked in green and will show up in a selection overview at the bottom of the page. Selecting multiple categories is possible as well, and you can specify the inclusion/exclusion of the selected categories via the slider button. We are connected to more than 50 ad exchanges. 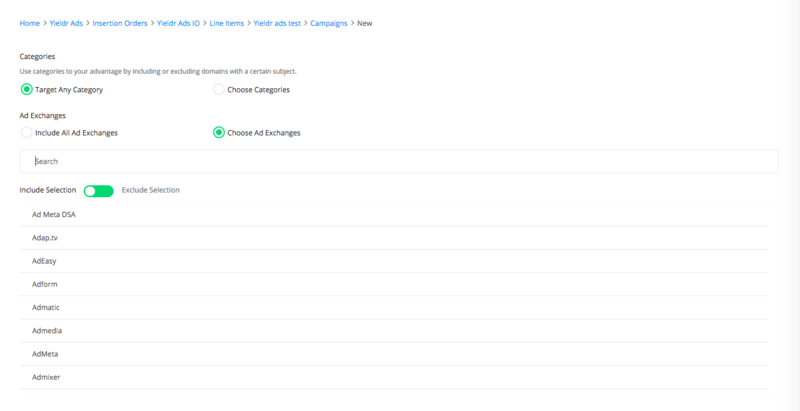 Via the "Choose Ad Exchange" option you can select which exchanges you want your campaign to run on. You can include/exclude one or multiple via the slider button. By default your campaign will run on all available exchanges. If you need any advice on which one(s) to target specifically, please contact Yieldr support. 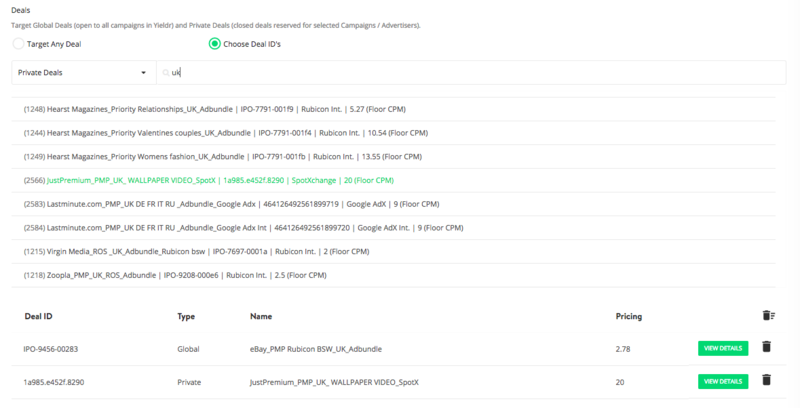 You can also manually select publishers you want to target or exclude on your campaign. You can find your publisher by typing in the name or the publisher ID. Please be aware that publishers might use various SSPs to distribute their inventory. Please make sure you select all relevant publisher/SSP combinations for your campaign. Something else to note is that not all SSPs disclose their publishers’ names to us. That is why these unmapped publishers cannot be targeted or excluded directly and/or exclusively. 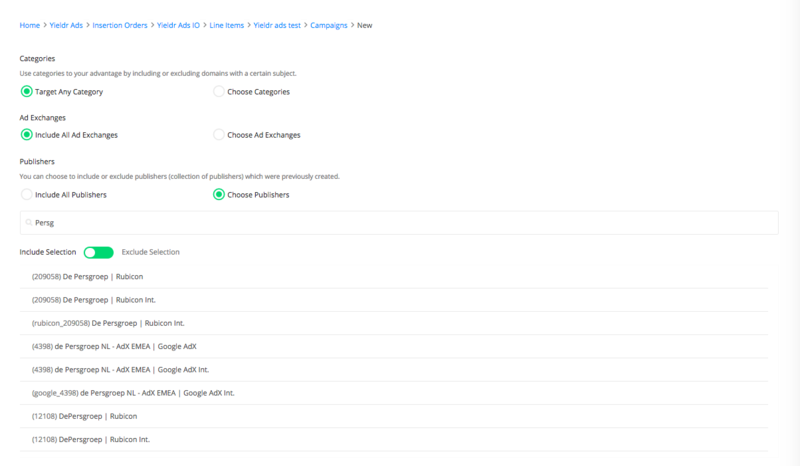 The option to target specific sites is still visible in the Yieldr Ads platform, but will be deprecated in Q3 2018 and should no longer be used with new campaigns. You can also target your campaign specifically on either a global or a private deals. Global deals are deals which are set up by Yieldr without any advertiser restrictions, which means they can be used by everyone; by all clients and on all accounts. Private deals were closed and set up specifically for an advertiser and can only be used by that specific advertiser. Deals that you set up for your own seat will automatically show up as a private deal. You can select multiple deals per campaign and you can also select a combination of global and private deals. Navigate to "Targeting Options > Domains" in the campaign editor to set up the domain selection for your campaign. 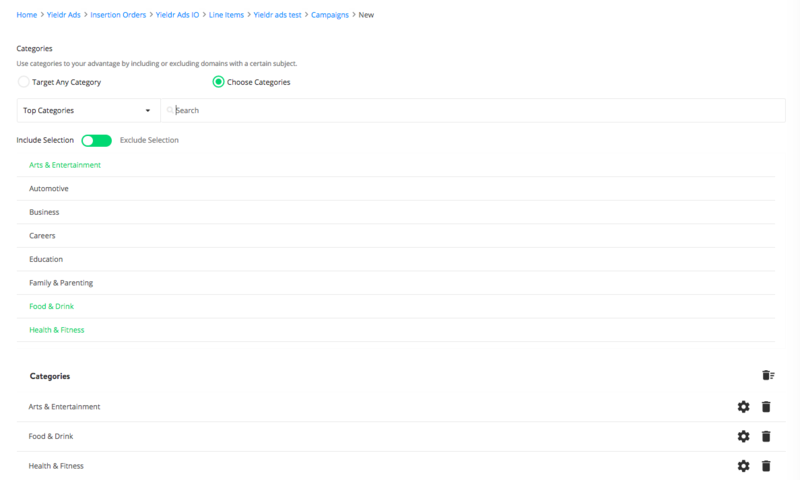 You can select a specific domain list with a pre-selected number of domains to target or exclude on your campaign, or you can select them manually on your campaign. You can add a maximum of 25 domains, the prefix www is not necessary. By default, all known domains are included in the targeting of your campaign. If you want to make sure that your campaign runs (only) on very specific inventory, or if you want to exclude that inventory, using a domain list is the easiest way to go. Especially when you want to target or exclude the same domains on several campaigns, or when you always want to use the same domain targeting settings. You can read how to create a domain lists here.